The grant of arms conveyed by royal warrant was presented by Her Majesty the Queen to the President of the Senate of the island on February 14, 1966 on the occasion of the Royal Visit to Barbados. Prior to this grant of Arms the only other heraldic device was the seal of the colony. It represented the British Sovereign in a shell chariot, drawn by two sea horses through foaming waves. The Golden Shield of the Arms carries two Pride of Barbados flowers (the National Flower) and the Bearded Fig Tree (ficus Citrifolia) which was common on the island at the time of its settlement. On either side of the shield are the supporters-on the right is a dolphin symbolic of the fishing industry and on the left is a Pelican, after Pelican Island, a small outcrop later incorporated into the Deep Water Harbour development. Above the shield is a helmet and mantling and on a wreath is the arm and hand of a Bajan holding two crossed pieces of sugar cane symbolic of the sugar industry. This is a saltire cross, the cross upon which Saint Andrew was crucified. Independence day in Barbados is celebrated on November 30, Saint Andrews Day. The Coat of Arms carries the motto "Pride and Industry." Born in 1912, C. Van Roland Edwards started composing while at school as a pupil of St. Peter's Church Boy's School. Although he had no formal training he had been a member of the British Song society since 1933. Because of his partial blindness has was assisted in his work by his two daughters Nannette and Eullia. 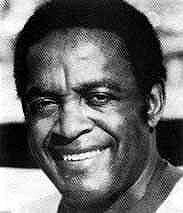 Mr. Edwards was know for his compositions "The St. Andrew Murder", "The Goodman song" and "The Federation song". He also composed "Welcome to Her Majesty the Queen Elizabeth II" which was sung in the presence of the Queen when she opened the St. Elizabeth School in St. Joseph during the official visit to the island in February, 1966. In 1967 the music of the National Anthem was re-arranged. This work was undertaken by Inspector Prince Cave of the Royal Barbados Police Band. He had earlier that year returned from a three year Band Masters course at the Royal Military School of Music, Kneller Hall. The Anthem was given a more sustained harmony while at the same time retaining the original tune. 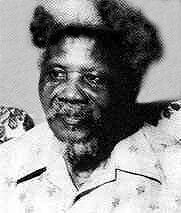 The Lyrics of the National Anthem of Barbados were written by Mr. Irving Burgie who was born in Brooklyn, New York, U.S.A. of a Barbadian mother and American father. Mr. Burgie whose stage name is Lord Burgess was born in 1926. He served in India and after his return to the U.S.A. he entered the University of Southern California and studied Music and performed in many cities of the U.S.A.
Mr. Burgie has composed works for "Ballad for Bimshire" and "Island in the Sun", he has also written for a number of internationally famous Artistes. Among his works is "The West Indian Song Book". He is a Life Member of the NAACP. Mr. Burgie who is a frequent visitor to Barbados has instituted the Irving Burgie Literary Award for Barbadian school children. References to this flower were recorded as early as 1657. It is a shrub and is often pruned into a low hedge. If untrimmed it grows to a height of 10 to 15 feet. It is a member of the Legume family and can be found in other tropical countries. The Pride of Barbados blooms most of the year, the more common varieties are a fiery red and yellow although other colour variations can be found. The flower has five petals with a yellow margin in a pyramidal inflorescence. 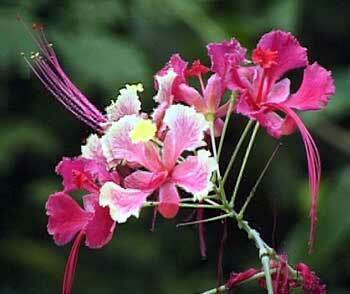 Each flower is about 1� inches across with five sepals. The ten stamens are long and the pistils project from the centre of the flower. The National Flag of Barbados is composed of three vertical panels - the outer panels of ultramarine and the centre panel of gold. A broken trident in black is the centre of the flag. The British standard colour code numbers for the colours of the flag are as follows - Ultramarine -- BCC148, Gold --BS0/002. The flag is designed in the proportion 3:2. The description of the flag - Blue for the sea and sky of Barbados; Gold for the sand of its beaches.